Leeson, Dr. James “Jim” – of Toronto, and formerly of Wiarton, peacefully surrounded by his loving family at Sunnybrook Health Sciences Centre, Toronto on Tuesday, March 3, 2015. Dr. James Irving Leeson was received into the arms of the Lord at the age of 91 years. Loving husband to Charmaine (nee Torrance) for over 63 years. Cherished father of Tanya and her husband Nabil Shalaby, of St. Johns, NL, Natasha and her husband Robbert Cooke, and Natalie Kirolos, all of Toronto. Devoted grandpa of Christina Shalaby, Nadia Shalaby, Nicolas Cooke, Benjamin Cooke and Jonathan Kirolos. Brother of predeceased Ruth Ballantyne and Lucy McCallum. Jim along with his wife Charmaine, a nurse, started his medical practice in Wiarton from 1958 until he retired 1999. 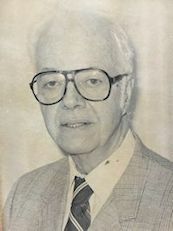 He was the President of the Bruce County Medical Society; he was the president of the Ontario Chapter of College of Family Physicians of Canada in 1969-1970. Jim was a coroner for 20 years and worked for Worker's compensation for many years. He hosted preceptorship of medical students from University of Western Ontario and University of Toronto. Jim has been a Rotarian in Wiarton since 1964; a member of the Bruce Peninsula Sportsmen; Royal Canadian Legion Branch 208, Wiarton; Cedar Lodge #396, Wiarton; and was a Flying Doctor and proud member of COPA since 1962. As a Veteran of WWII, Dr. Leeson served Canada with honour. At Dr. Leeson’s request, cremation has taken place. Family wish to announce a Celebration of Life Service to be held at St. Paul’s Presbyterian Church, 553 Gould St., Wiarton on Saturday April 11 at 1 o’clock. Services shall be comprised of a Masonic Memorial Service (Cedar Lodge #396), followed by a Legion Service (RCL Br. 208), and then the Celebration of Life Service. A reception will be held following services at the Thomas C. Whitcroft Peninsula Chapel, 272 Berford St., Wiarton (519) 534-5341. In lieu of flowers, donations to the Wiarton Hospital or St. Paul's Presbyterian Church would be appreciated.